The meaning of a union is to stand together. With Labor Day around the corner, it resonates that much more. UFCW has always responded in times of crisis. During Hurricane Katrina, UFCW members raised over $1 million. This is who we are as a union. And now we call on us again to stand in solidarity with our Sisters and Brothers affected by the aftermath of Hurricane Harvey. The category 4 hurricane hit Texas over the weekend with devastating effects. Over 15,000 UFCW Local 455 members and their families have been drastically affected, experienced loss or been displaced by the disaster. Many have lost their homes, belongings and many are still without power. They are in need of food, clothing, medication and daily essentials. UFCW Local 455 members have been directly impacted. Local 455 has set up a Membership Assistance Fund. Funds will be distributed to members and their families in need. Let’s send this message of solidarity and the knowledge that we are stronger together and they are supported by their Sisters and Brothers from across the country. Our hearts go out to the people of Texas. The road ahead will be tough, but we can rebuild together. Checks should be made out to UFCW Local 455 Membership Assistance Fund. 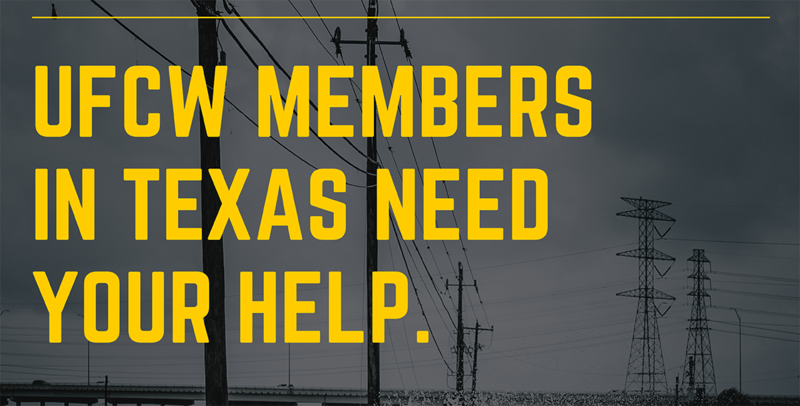 If you have any questions about the UFCW Hurricane Harvey Relief Fund or are looking for additional ways to help members of our union family in the city of Houston and other parts of Texas affected by this terrible storm, please contact Debbie Edwards at UFCW Local 455 at 281-448-5555 or 800-654-8329.